Last Sunday I gave feedback to Ancestry on my ThruLines. As I was writing the feedback message I realized it might be good material for a blog post. At the end of the feedback message, I let them know I might use it in a post. Dear Ancestry, My Feedback on the Step Relationship Bug in ThruLines sat around in my drafts until Wednesday. I took a few moments to check my ThruLines as I’ve done every few days since they came out – getting more and more irritated. Wowsers! Those ugly grrr!! images I’d added to my great-grandfather’s step-mother and all of her ancestors are missing. Could it be Ancestry took my feedback into consideration and got the step-relationships fixed? Had they been ready to roll out a fix before or after I sent my feedback? Does it matter? Well, yes, I would like to know why it happened so quickly following the feedback I gave. I want to know if this step relationship bug in the ThruLines was solved for everyone or just for me. I’m seeing Milla Susan PETERS as my great-great-grandmother. I’ve been hoping to see her ever since they gave me Nancy Elizabeth JOHNSON, the 2nd wife of Gordon Washington ROOP, as a potential 2nd-great-grandmother showing half-cousins as full cousins. Why, you ask, was I so excited about one ancestor being corrected? One right ancestor means I should be seeing her parents, grandparents, and great-grandparents in my ThruLines. All of these ancestors are from lines with many descendants who have had their DNA tested. It’ll take time to confirm each match is a descendant of the ancestor he/she is listed under as the lines down are only as reliable as the trees ThruLines uses to make the connection. The large number of matches for the PETERS, LIVELY, PROFFITT, and COCKRAM lines was expected due to the families being large and having many descendants. William A. W. DEMPSEY and Sarah Ann WOOD as my 2nd great-grandparents. They’ve been missing from the ThruLines since they came out. William is my most frustrating brick wall. Sarah Ann’s branch and all matches associated with it are very important. I hope they will help me to sort out all the matches for her side. This would leave only matches which will point to William’s unknown parents and ancestry. At least that is the way I believe it should work. ThruLines is showing potential parents for him which I cannot accept at this time. Sarah Ann WOOD’s ancestry is bringing in many matches which will also have to be verified. 41 DNA matches through William A. W. DEMPSEY. ThruLines are now connected to the tree linked to a DNA test. On the pedigree view of the tree, there is now a DNA symbol in on the left to turn on this feature which adds a little blue ThruLines icon next to the ancestors’ names. 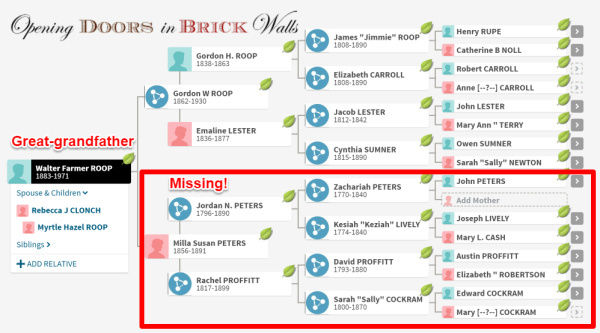 William, Sarah, and Milla are ThruLines ancestors but in the pedigree view above they haven’t been updated. I discovered this about the same time my ThruLines were fixed on Wednesday. Did the feedback I sent on Sunday to Ancestry on the ThruLines help them to get this fixed? I will likely never know. But I believe this was a lesson in giving the best feedback possible to help the team to get ThruLines working correctly. As I wrote in my feedback to them, ThruLines could be a powerful tool. This is the first of two posts on Ancestry‘s ThruLines regarding an issue I have had with the new feature. Access to ThruLines™ Beta is available to customers without an Ancestry subscription for a limited time. Unfortunately, hundreds of user trees on Ancestry cannot be taken into account when building ThruLines. 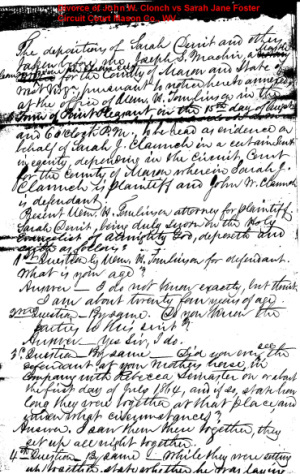 The Legal Genealogist went ballistic last Saturday and wrote How do we know? It’s an excellent post with an example of a user tree which cannot be taken seriously. Judy G. Russell recognized the errors in the tree but can a computer program do the same? I think not. This is not meant to provoke negative comments concerning Ancestry and the features offered by them. This is about giving feedback concerning a known problem in hopes of getting positive results. I have given feedback several times before [concerning the reason I am not satisfied with ThruLines] and will try to be more detailed as there is a bug in the system which has not been fixed. I realize, at this time, ThruLines is a free tool on AncestryDNA. However, your long-time customers’ experience in family history research should be taken into account. We can work together to get this fixed. The problem is a known bug in the system as other users have complained about it on social media. Some users who gave feedback say their ThruLines were “fixed” within days. I do not believe Ancestry has taken the step to go into one user’s ThruLines to fix this bug. I strongly believe it was a coincidence the users’ ThruLines were corrected after feedback. It is more likely another user’s tree, which was being used to build the connection between the ancestor and the match, had been corrected and this resolved the issue. I am seeing a step-parent as the parent in the ThruLines. The information is correct in my tree. No other tree is being used to create this ThruLines ancestor. Along with this step-parent, I am seeing all of her ancestors, unrelated to my line, as my ancestors in ThruLines. Not as POTENTIAL ancestors with a dotted borders – they are being shown as ANCESTORS. Screenshot courtesy of Ancestry. I included the link to this image in my feedback. This is the pedigree of his first wife, my 2nd great-grandmother, who along with all of her ancestors are NOT showing up in my Thrulines. There are many DNA matches for people who descend from her PETERS, LIVELY, PROFFITT, and COCKRAM lines, on the match list, but they are being ignored by ThruLines. 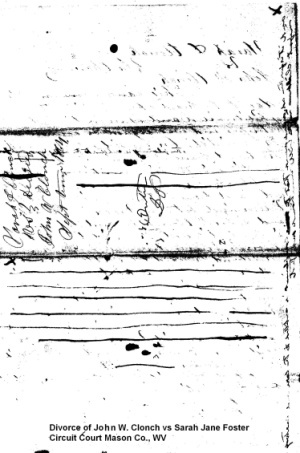 I want to stress that ONLY entries in my tree are being used for this (incorrect) ThruLines ancestor. No other user tree is being used to make this connection between the half-cousin matches whose relationship is incorrectly calculated to full cousins. I understand the idea of ThruLines and believe it could be a powerful tool. One problem will always be the hundreds of trees which are incorrect due to sloppy research, i.e. accepting hints without looking at dates, places, names, etc. However, in this case, the tree being used is correct and ThruLines is overriding my information and picking the wrong person in the tree. I have no experience in programming. I can only tell you where I am seeing the bug. I’m fully aware of the fact that detecting the source of the bug may be more difficult. 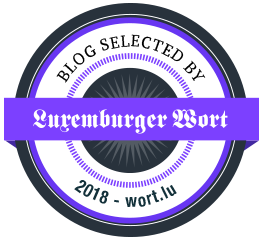 I wrote the above last Sunday but didn’t want to post it on my blog without giving Ancestry had a bit more time to fix the issue. This was the first time I included links to the specific areas where the “bug” was detected. Will this kind of feedback help resolve the issue I have with Ancestry‘s ThruLines? Don’t miss part two tomorrow. Rewriting the Biography has become a catch-all for not only the biography of my 5th great-grandfather James SIMS (1754-1845) but also his children and their descendants. I took a break from working on this series after doing the census work and posts for his sixteen children. 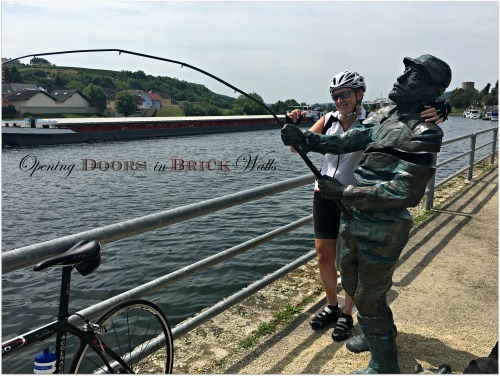 While I was working on these last year, Patricia Simms Williams shared this lovely tribute written by her grandfather following the death of one of his children. The Genealogy Sketch box puts this family in perspective to James SIMS, Patricia, and myself. Charles Edward SIMMS was born in 1866 to William Thomas SIMS and Mary Catherine WILLIAMS. His father died in 1870 and his mother remarried in 1872. He had two siblings and 5 half-siblings. Charles married his first wife Lydia Ellen WILLIAMS in 1887. She gave him two sons and a daughter before her death. Charles married again in 1896 to Cora Estella HURLEY. By 1900 the two sons from his first marriage had died and his household included his wife Cora, his daughters Ophelia from his first marriage and Laura B. from his second marriage. Cora was listed as the mother of two children, one living. This would mean Charles had lost three children by 1900. In 1902 a son was born to Charles and Cora. No record of birth has been found for him nor a record of his death in September 1905. His name and years of birth and death have been passed down in the family history. Cecil James SIMMS died after his father came in contact with measles while stopping off at a neighbor’s house. This is his recollection and tribute to his son. 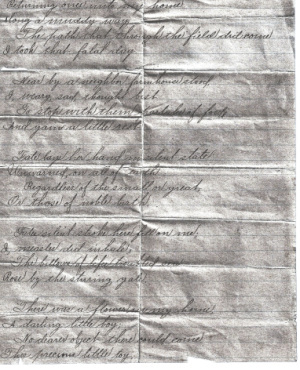 The scans of the pages with the handwritten poem did not include a title. I’ve taken the liberty to give it this title. I took that fatal day. and gain a little rest. Rose by the stirring gale. And sing in joyful lay. It perished by our side. They will bloom forever there. This poem conveys Charles’ feelings, his love for his son Jimmy, and the sadness of losing him. It was written like a hymn which is not unusual as Charles was a preacher and teacher. In the years which followed Charles was also a manager for Singer sewing machines as well as a jewelry shop owner. 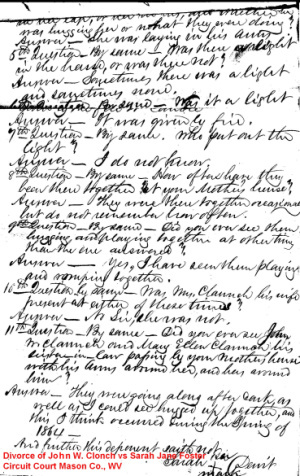 Laura was not married to Joseph Edward Bruffey, the father of her son Joseph Eugene Bruffey. For some reason, Laura’s mother Cora didn’t want her to get married. Laura had polio as a child, childbirth was hard for her and she died the following day after giving birth to Joseph Eugene. The Bruffey’s wanted to raise the baby but grandma Cora refused to let them. After all of these losses in Charles’ family, his children Ophelia, Charles, Carman, and Cluster lived long lives. Ophelia lived to be 82, Charles 69, Carman 70, and Cluster 93. It should be shared with someone who will take care of it after I’m gone. By featuring it here, I hope it will not be lost to future generations interested in our SIMS ancestry. 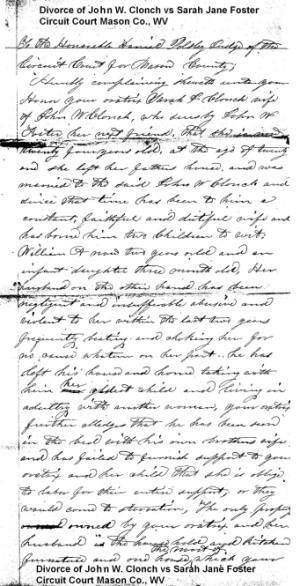 Less than two hours after I posted Gathering Records to Tell the Story in late February my fourth cousin Ralph L. Hayes sent emails with images of the Chancery records for the 1864 divorce of John William CLONCH and Sarah Jane FOSTER – records which are not online. I was surprised and happy to finally see the records he had discovered years ago when he searched through old dusty unindexed boxes at the courthouse in Point Pleasant, West Virginia. 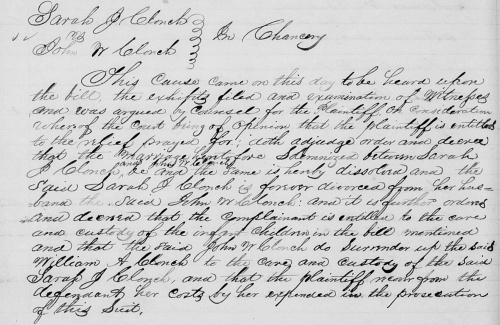 In Gathering Records to Tell the Story, I shared the entry in the court records concerning the divorce of my 2nd great-grandfather Alexander CLONCH from his first wife Mary Ellen LEMASTER. I’d only recently found this record and could not wait to share with my cousins who descend from the CLONCH line. By sharing what I’d found I may have been subconsciously baiting cousins. Don’t we do this all the time? Sharing bits and pieces in hopes of a relative coming forward with new information. I wasn’t expecting Ralph to message me via Facebook so soon after I’d published the post. We hadn’t done email in 15 years but have been keeping up with each other via Facebook for 10 years. 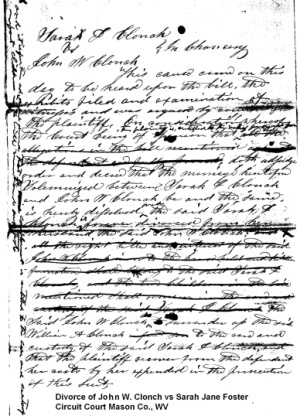 John W. CLONCH married Sarah Jane FOSTER on 20 February 1862 in Gallia County, Ohio. 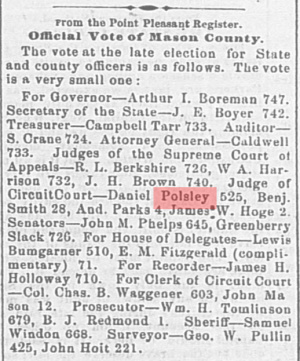 Many residents of Mason County crossed the Ohio River and state line to marry in Gallia. If Sarah Jane carried her first child to full term, she may have been with child when they married. Their son William Alexander was born on 2 October 1862. A year and a half later, about April 1864, a daughter was born to John and Sarah. By this time the marriage was already in trouble and divorce was the next step for Sarah. 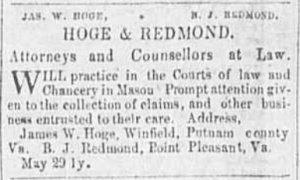 I found a couple of entries in the Chancery orders and in a fee book concerning the divorce in 1864 when I located my ancestor Alex’s 1880 divorce records. My mentioning the 1864 documents in Ralph’s possession were not yet online pushed him to get in touch and email them to me. I’ve been a bit slow working on the documents as other things have kept me busy during the past few weeks. I watched several of the 2019 RootsTech live sessions and got caught up in the DNA whirlwind caused by Ancestry and MyHeritage’s new tools. I’ve used up all 24 of the colors offered for grouping matches in the New & Improved DNA Matches (Beta). I’ve played with MyTreeTags on the small tree linked to the test I manage on Ancestry and found they are an excellent new tool for tree management. ThruLines is still aggravating me. They have a known problem with step-parents being considered as the ancestor. MyHeritage’s Theory of Family Relativity did not take long to look at as only 29 matches were offered. Several were spot-on. Several were not. Their AutoClustering was a bit disappointing as I was already spoiled by Jonathan Brecher and his Shared Clustering tool. 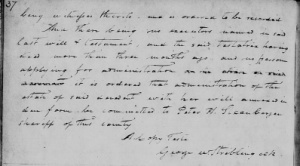 Ralph said, “Go for it!” In the days to come, I’ll share the transcriptions of the records he sent from the chancery case Sarah Jane Clonch vs John W. Clonch. Last week was an exciting week for many genealogists who attended the RootsTech conference or, like me, who followed the live stream from home. My interest was focused on DNA related news. Ancestry added MyTreeTags™, New & Improved DNA Matches, and ThruLines™ to their site. The most talked about is ThruLines™ which is available to customers without an Ancestry subscription for a limited time. I found a few things about ThruLines™ which were helpful but there was something which upset me so much that I stopped checking. I took a few days to calm down before I gave feedback to Ancestry on their new ThruLines™ tool. First the good and the bad, then my feedback. There are several reasons for my snarky title. I may know and you may know that ThruLines™ is not the same as true lines or true lies. 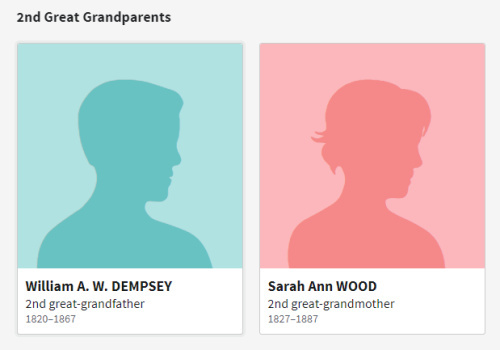 But do all users, especially those who are very new to family history research, realize this new feature is like the Ancestry Hints and Shared Ancestors Hints? It isn’t a fast and easy fix. We still need to do research. 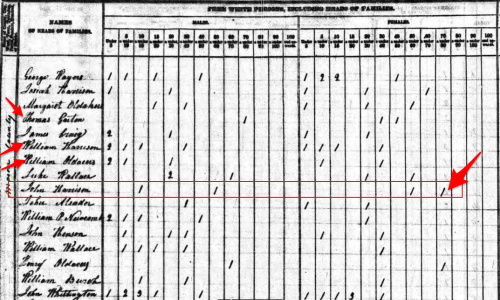 ThruLines™ has helped me to find two cousins descended from my great-grandmother Laura Belle INGRAM’s half-sister Ocie Ola INGRAM. Ocie has been ignored by many in their trees. The marriage of her mother to my great-great-grandfather Irvin Lewis INGRAM took place in 1888 and no 1900 census listing has been found to show the family group. As far as we know, they had only this one daughter. The marriage ended in divorce in 1904. I have tried to follow Ocie’s children and grandchildren but I would probably not have found these DNA cousins without looking through thousands of matches. ThruLines™ pulled them right up and with the correct connection even though the matches did not have public trees back to the INGRAM common ancestor. I’m now seeing 63 of my 64 maternal 5th great-grandparents in the ThruLines™. The missing ancestor, Gerard MALAMBRE, was found in other trees with a different surname spelling. It wasn’t a surprise to find all maternal ancestors except this one listed. Not many people who have worked on these lines have their trees on Ancestry. I have very few maternal matches, mostly 5c and 6C, from clusters of descendants of a few immigrant families in America. 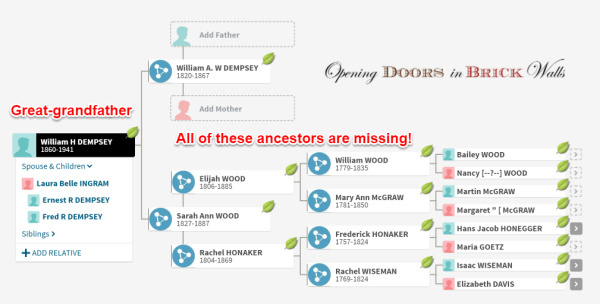 Ancestry’s New & Improved DNA Matches and ThruLines™ are ignoring my 2nd great-grandparents William A. W. DEMPSEY and Sarah Ann WOOD as the parents of my great-grandfather William Henderson DEMPSEY. In the case of this family line, ThruLines™ resembles quick & dirty tree work which shouldn’t be public or searchable unless it has been proven. Don’t get me wrong. They haven’t changed my tree. People who are new to genealogy research and those who do not know how to use this tool will take this seriously. They will accept these errors without bothering to verify. Screenshot of Common Ancestors of a match on AncestryDNA. According to Ancestry family trees, these are common ancestors. The white boxes are actual entries in my tree while the dashed boxes are from information they have knitted in from other trees. The third cousin match has a private tree which likely includes William A. W. DEMPSEY as he is showing up on the match’s side. Why, if we both have this name in our trees, does the common ancestor show up as a Private person three generations further back? Why not William A. W. DEMPSEY? 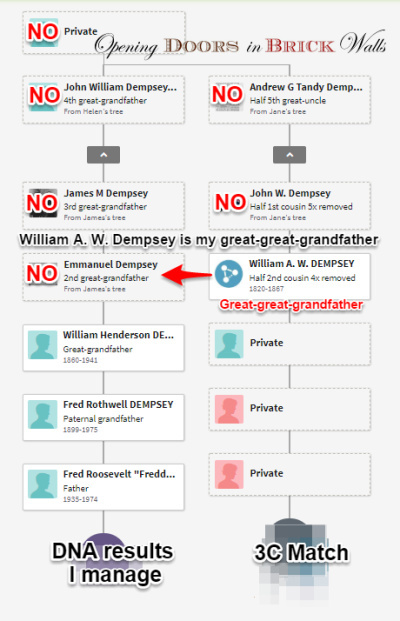 ThruLines™ shows Emmanuel DEMPSEY of Logan County, West Virginia, as the father of my great-grandfather William Henderson DEMPSEY and this is reflected in the Common Ancestor match above. 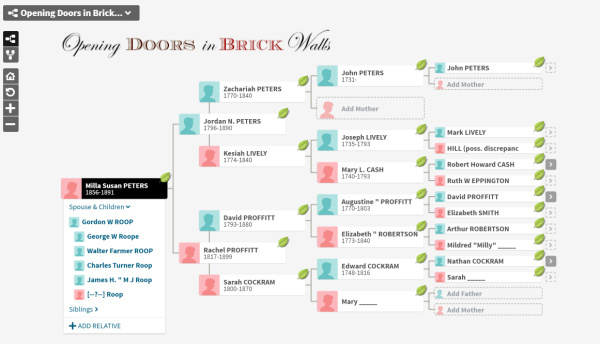 I was hoping this new feature would help with my great-grandfather’s father William A. W. DEMPSEY’s brick wall. I was able to get the error above fixed. A person with a large tree likely accepted a Potential Father and Potential Mother and attached the wrong parents to my great-grandfather. The owner is not a direct descendant. The tree is so large I could not figure out how or if he is related. I placed a comment on the tree with the wrong father for William Henderson DEMPSEY. The tree owner was quick to thank me for the help. He unlinked him and added the correct parents. There are still a few issues which I have further commented on. The owner appears to be willing to work on fixing his tree. In ThruLines™ Emanuel DEMPSEY, his parents James DEMPSEY and Dorcas HAGER, his grandparents John DEMPSEY and Rachel SOLOMON, as well as the HAGER and VANNATER grandparents, have disappeared as potential ancestors. On a positive note, I was surprised to see this happen overnight. I’m very disappointed I’m not seeing my 2nd great-grandparents William A. W. DEMPSEY and Sarah Ann WOOD as ancestors. 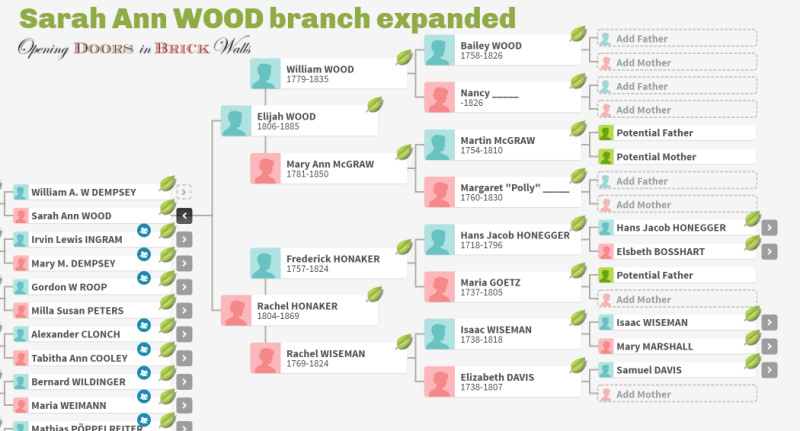 There are hundreds of matches who descend from Sarah’s parents, grandparents, and great-grandparents (WOOD, McGRAW, HONAKER, HONEGGER, WISEMAN, and DAVIS) and they are not being found with the ThruLines™ tool. Matches I need to sift out of the rest to be able to find fourth cousins who descend from William’s unknown parents or more distant cousins who descend from his parents’ ancestors. 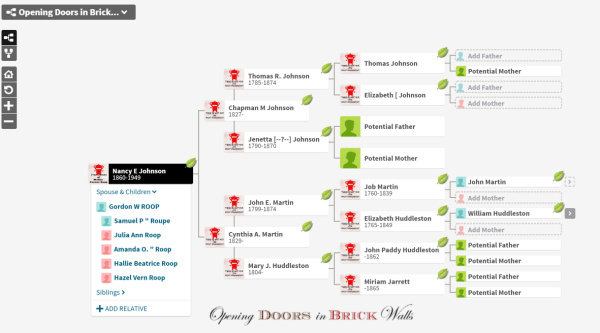 Screenshot of my public tree on Ancestry. These are ancestors who were in Circles. This is not the only 2nd great-grandparent who is missing. My Gordon Washington ROOP was married twice and there are DNA matches coming from both wives. However, ThruLines™ is only recognizing his second wife, the step-mother of my great-grandfather Walter Farmer ROOP. This means I have the wrong potential 3rd, 4th, and 5th great-grandparents. 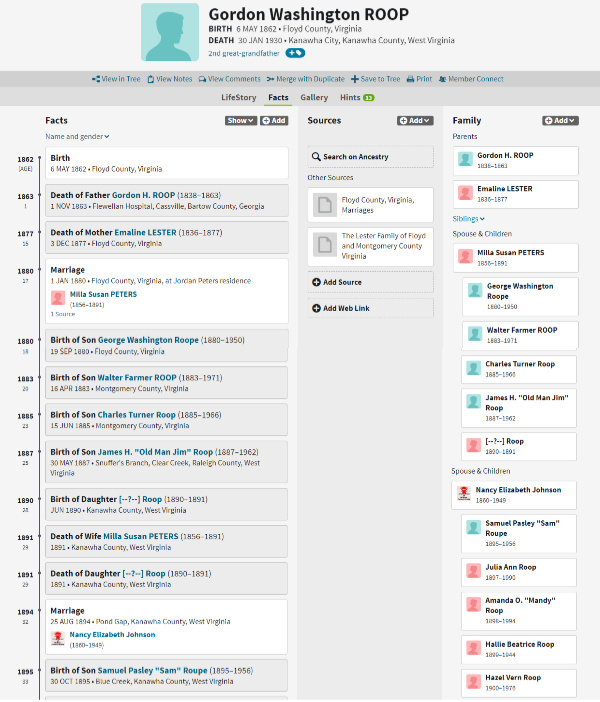 Once again this is a branch of the family which has hundreds of matches, descendants of PETERS, LIVELY, CASH, PROFFITT, ROBERTSON, and COCKRAM. The branch and all other matches are missing. Yes, they are still there but difficult to ferret out. This could be a good feature when used correctly. When we find cousins who are DNA matches and fit into our tree we cannot accept the connection without following the records to prove the relationship. I’m worried about the people who accept shaky leaves, potential parents, and now a line back to a potential common ancestor using 2, 3, or 4 trees. I don’t want to throw away the good with the bad. I’ll take a close look at each ancestor and the matches they are supposedly coming from. I’ve had a public tree with only ancestors linked to the DNA test I manage. I don’t have any other public tree on Ancestry. In the past days, I’ve added known and proven matches to fix some ancestors on the ThruLines. It’s strange that the lines with the most descendants are not showing up correctly. I’m hoping this might turn out to be more positive – with people cleaning up their trees so that the correct connections get noticed. I’m finding ThruLines useful in that it pulls up distant matches which would not have been found due to the thousands of matches which are impossible to sift through. I would not say that it adds value to my Ancestry experience. It only reminds me of the many errors in trees. Mine is not perfect and the reason I attached a public tree to DNA with only ancestors. In hopes this will help improve ThruLines, I have started to add the siblings of ancestors with DNA connections and the descendants who are DNA matches. Since the public tree I’m using is based on well-researched work on my part, I hope it is being managed appropriately by Ancestry and not being used to suggest false potential ancestors as I am seeing up to 4 different trees are being used to show a line down from a potential to a match. I DO NOT want a quick and easy way to add an ancestor or a match to my tree or anyone else’s tree. I believe people should take time to analyze and then add to the tree. Any trees with quick & dirty work should be made private and unsearchable. I strongly disagree that having a common ancestor with a match is proof that the DNA is coming from this ancestor. The only way this can be proven is by using a chromosome browser for comparing with other matches with the common ancestor. Although I am not overall happy with ThruLines at this early time, I strongly agree that we should check back often as more people take the test. New & Improved DNA Matches gives us the ability to sort matches using colored groups. MyTreeTagsTM should help eliminate the need for strange ancestor names and keep our research and connections to new matches more organized. The lists of matches who descend from common ancestors seen in ThruLines™ will help both our research and proving of ancestors. Will all the hoopla about these recent additions to the Ancestry experience distract us from the lack of a chromosome browser? Perhaps for a while but I’m still referring matches to my Dear Cousin post. 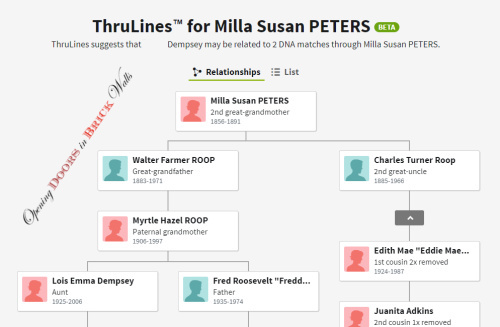 Author Cathy Meder-DempseyPosted on March 6, 2019 April 20, 2019 Categories DNA, GenealogyTags AncestryDNA, Genealogy, MyTreeTags, rootstech, ThruLines™40 Comments on ThruLines™ Introduced by Ancestry: TrueLines or TrueLies? I’ve wanted to find the documents Ralph discovered as the story of the CLONCH brothers is so difficult to believe. 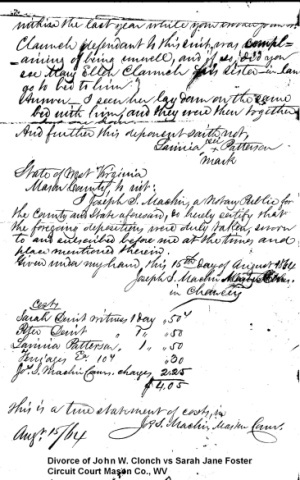 Since FamilySearch has added more collections from Mason County to their online records, I’ve been looking for this and that record to better tell the story. Ralph L. Hayes is my fourth cousin. He descends from John William CLONCH (1840-1919) and Mary Ellen LEMASTER (1847-1921) while I descend from Alexander CLONCH (1842-1910) and Tabitha Ann COOLEY (1861-1913). John and Alex were the sons of our 3rd great-grandparents William CLONCH (1807-1863) and Mary E. “Polly” DOSS (c. 1816-c. 1892). 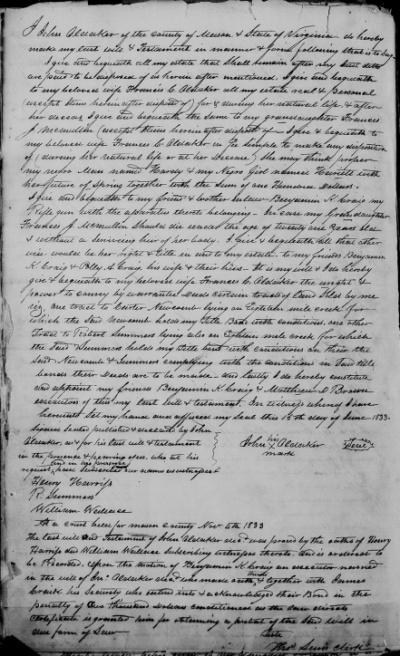 If you’ve been following recent posts about William CLONCH’s estate, you’ll have learned William and Mary were not married but had eight children, seven grew to adulthood and married, six had children. 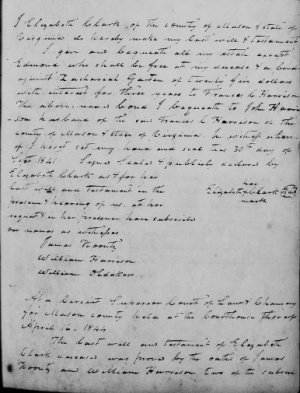 William kept the family together beyond the grave by leaving a will in which he stipulated the land the family lived on was to remain in the family. 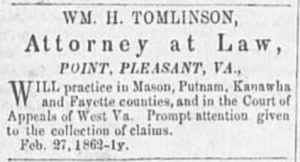 Did he know at the time of his death in 1863 that his two oldest sons would become part of an incredible story equal to a primetime soap opera? I wrote A Little “Peyton Place” (Part I) and A Little “Peyton Place” (Part II) in December 2013 but the posts only recount what Ralph learned while researching and don’t include documentation. Living overseas and nowhere near the American courthouses of the counties my ancestors lived in, I must rely on record collections found online. FamilySearch’s catalog is my go-to place whenever researching and gathering records to tell their stories. Alexander and Mary Ellen never had children even though by 1880 they were legally married a little over seventeen years. To be more precise, they never had children with each other. Alex’s brother John and Mary Ellen had eight children between 1865-1880 and Alex had 3 children with Mary Ellen’s sister Rebecca from 1868-1876. 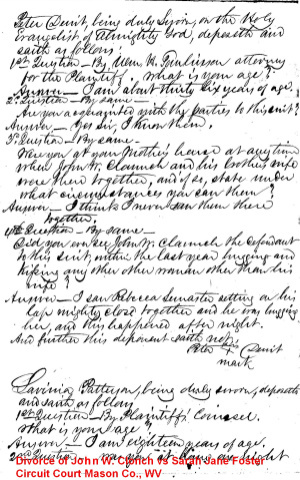 Many online trees list Rebecca LEMASTER as Alex’s second wife. 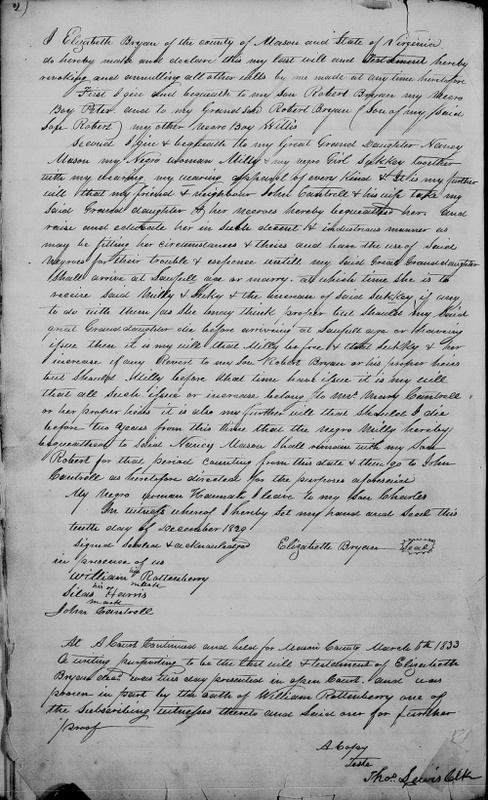 A marriage record was not found in West Virginia or Ohio. Is it possible they were married and the record has yet to be found? 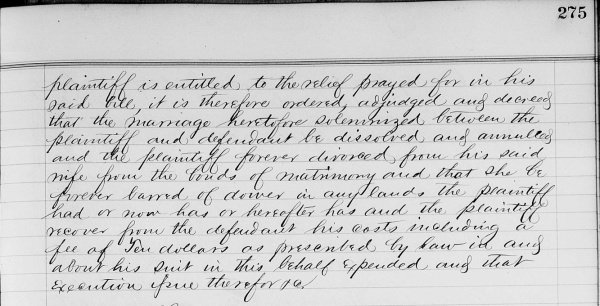 plaintiff is entitled to the relief prayed for in his said bill, it is therefore ordered, adjudged and decreed that the marriage heretofore solemnized between the plaintiff and defendant be dissolved and annulled and the plaintiff forever divorced from his said wife from the bonds of matrimony and that she be forever barred of dower in any lands the plaintiff had or now has or hereafter has and the plaintiff recover from the defendant his costs including a fee of ten dollars as prescribed by law in and about his suit in this behalf expended and that execution issue therefor & c.
The marriage was dissolved, Mary did not appear and she does not get her dower and must pay costs. One document at a time, the complete story may one day be told.